Salute to Patriotism and Perseverance, an original production produced and hosted by filmmaker and World War II Foundation founder Tim Gray, brings home a local perspective to the national documentary GI JEWS: Jewish Americans in World War II on April 19. The special half-hour program shares local Jewish-American soldiers’ experience in the war - on the field, and in the barracks as well. A Salute to Patriotism and Perseverance features Samuel Buckler, who served in Intelligence and Communications in the Pacific; Joseph Joel from the 30th Infantry Division during the Battle of the Bulge in Europe; Leon Resnick of the Army Combat Engineers; and Melvin Kahn, who served in the US Navy in WWII. A Salute to Patriotism and Perseverance premieres Thursday, April 19 at 8 p.m., in advance of the broadcast of the national documentary, GI JEWS: Jewish Americans in World War II at 8:30 p.m.
GI JEWS: Jewish Americans in World War II is the first feature-length documentary for public television to tell the profound and remarkable story of the 550,000 Jewish Americans who served their country in World War II. These men and women fought for their nation and their people, for America and for Jews worldwide. Like all Americans, they fought against fascism, but they also waged a more personal fight—to save their brethren in Europe. After years of struggle, they emerged transformed, more powerfully American and more deeply Jewish, determined to continue the fight for equality and tolerance at home. 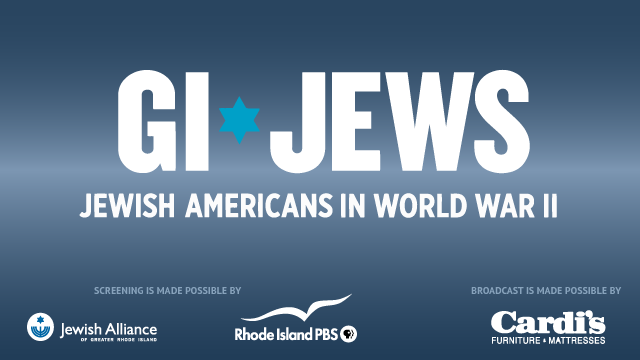 Leading up to this two-hour special on April 19, Rhode Island PBS will encore two of Tim Gray's documentaries featuring local stories of Jewish Americans in World War II. 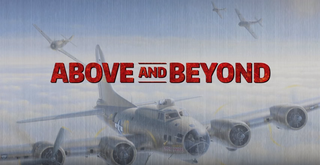 Above and Beyond describes the escape of downed Jewish American B-17 pilot Bruce Sundlun from Nazi-Occupied Europe in World War II. Following WWII, Bruce Sundlun became a successful business man, advisor to presidents, and the 71st governor of the State of Rhode Island. Above and Beyond will air on Sunday, April 15 at 7 p.m. Promise to My Father re-traces the steps of Holocaust survivor Israel Arbeiter as he returns to Poland and Germany for the final time to look for items buried in 1939 in the basement of his old home in Plock, Poland as the German army advanced. The film also travels with “Izzy” to Treblinka death camp where his parents and younger brother were murdered, and to other camps, most notably Auschwitz-Birkenau, where “Izzy” used the motivation of his father’s final words to him to stay alive. He is also reunited with those who, at great risk, helped him to stay alive. A somewhat strained impromptu meeting with a former German soldier is also chronicled. A Promise to My Father will air on Wednesday, April 18 at 7 p.m.
All the while, they observed their religion, far from home. Jewish men and women sought solace in their faith and celebrated holidays overseas, even on the front lines. Some went without rations for days to keep kosher, and many carried a small prayer book with them on every mission. World War II was a watershed in American history—with 16 million Americans fighting for their country, everyone intermingled. Fighting together in the trenches and in the air, men forged deep friendships across religious lines, and learned to set aside their bigotry for the greater good. Jewish Americans earned their citizenship by shedding blood, leaving their outsider status behind. For the first time, the nation embraced them as true Americans. Jewish servicemen were among the first to reach the Nazi concentration camps liberated by American troops. 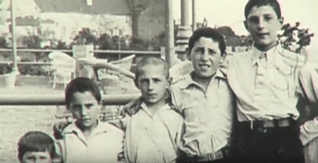 The many who spoke Yiddish were able to offer the survivors their first words of comfort and explain to them that after years of suffering, they were finally free. Rabbi chaplains said prayers for the dead and held services, honoring the survivors as the bravest heroes of the war. Many Jewish servicemen stayed on to help care for the survivors by locating relatives, fighting for their rights, and even smuggling thousands of them to Palestine. In the wake of the Holocaust, America’s Jewish community was now the largest in the world. With their new responsibility as international leaders, many American Jews became full participants in postwar culture and politics by fighting for social change. They would demand equality at home, join the battle for civil rights, and fight for the creation of a Jewish state. A community screening of the national film was made possible in late March through collaboration with the Jewish Alliance of Greater Rhode Island. The Jewish Alliance’s mission is to build and sustain the local and global Jewish community by maximizing philanthropic resources and volunteer efforts, as well as providing social, cultural, educational and wellness opportunities. The Alliance convenes agencies, synagogues, and organizations throughout the state of Rhode Island to address issues of common concern. Local broadcast of GI Jews: Jewish Americans in World War II, Above and Beyond, and Promise to My Father is made possible by Cardi's Furniture and Mattresses.